There are a number of hats to choose from which allow you to dress Sponge Bob up for different celebrations or themes. If you stick Sponge Bob to the wall and stick the hat to the wall over his head (don't put any tape or sticky gum between the hat paper and the head paper), you can easily remove one hat and put on another for changing themes! This paper craft is made with a printer, two or three pieces of paper (depending on whether you're using a hat), some crayons (optional), scissors and glue/tape. This craft is simple enough for even the youngest Sponge Bob fans to put together. Print out the template of choice (two templates for Sponge Bob and then choose one of the hats if you like). Tape or glue the pants onto the sponge. Tape or glue the face pieces to the sponge. 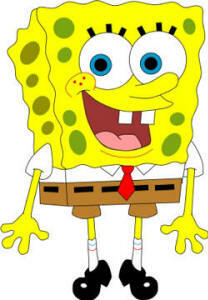 Tape, glue or use brass tacks to attach the hands and legs to Sponge Bob. If you use brass tacks, the hands and legs will be moveable. Tape or glue the tie to the center of the shirt. Tape or glue the hat onto the head. Some of the hat templates have something for Sponge Bob to hold in his hand (for example, the police hat template has a badge and the graduation hat template has an apple. These can be taped into the hand or beside his feet.